Go ahead and start by taking apart your shadowbox, removing the glass and setting everything aside for later. If your glass doesn’t come out of the frame (like ours) that’s ok! Just go ahead and tape off a smaller square on the inside of the glass PLUS whatever else you don’t want to get spray paint on. Once you are all taped off, go ahead and start spray painting the inside of your glass. Make sure you do this to the side of your glass that will not face forward. We ended up spraying about ten coats of this stuff. Some tips to make the mirror effect the best it can be - grab a high quality and clean glass + try to make your layers as even as possible. Once everything is nice and dry, remove all of the tape and grab some frosted spray paint. We are going to use this to frost the outside of the glass that isn’t mirrored! We did about three coats of this. A tip about this spray paint - it sprays a bit clearer than is dries, so use thin layers and wait for it to dry before the frosting take effect. Once everything is dry, go ahead and attach your LED rope light to the back piece of the frame. First go ahead and drill a hole to the back piece. Make sure the hole is big enough for the end of the rope light to fit through. Our back piece was already white, but if yours isn’t make sure you paint it white before this step! We attached the rope using some nails + a bit of hot glue to secure things even further. Close up the back and plug it in! 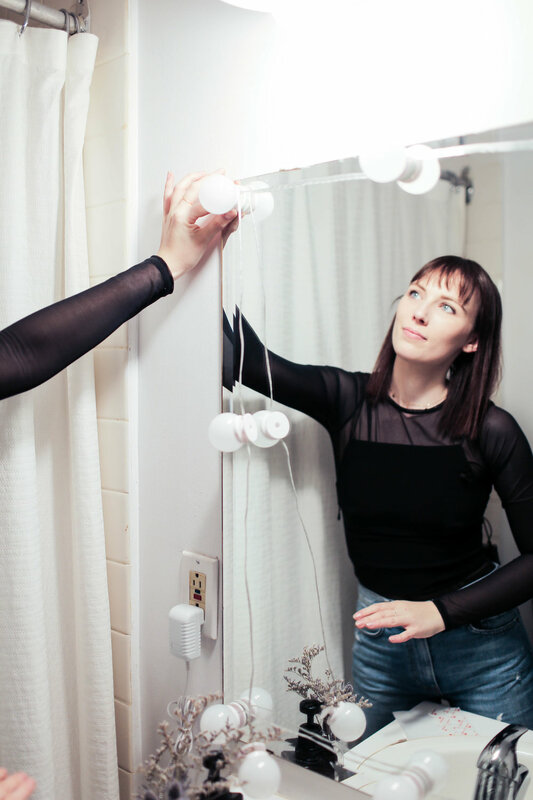 This hack that we wanted to share with you is a super easy way to upcycle any mirror into a lighted vanity mirror! Just add the sticky backs to the lights and space them out onto your mirror! Another great hack to add soft lighting to a setup that you already like is to hang two china ball lanterns on either side of your mirror. This looks awesome and adds the perfect amount of lighting to any setup! Our first step is to grab our thrifted mirror and remove the frame already on it. The next step is to build the wooden frame that goes around the mirror which the string lights will sit in. Go ahead and measure the size of the mirror, and build a frame around that mirror that slightly overlaps the mirror. This is so that we can glue the mirror to the back of the frame later. The last thing we want to do before we glue it all together is to drill some holes in the wood for the lights to sit in. Count the number of bulbs you have on a strand, and evenly space out that number of marks onto your wood all around the mirror. Use a wood drill bit that is big enough for the base of the bulb to fit through and drill holes at all of the marks you’ve made around the frame. We used a ¾” drill bit. Time to glue everything together! We used staples at the back of the frame to hold things into place while the glue dries. Once the glue is dry, go ahead and fill any holes you have using some wood filler. Let this all dry. Once dry, go ahead and paint the entire frame with black paint. Once this is dry, go ahead and insert the bases of the bulbs into the holes, and screw on the bulbs into the base! We used some wire management to tuck the wires at the back of the frame away! And that’s it! We love the look of this leaning up against a wall for a chic and chilled out look. Thanks for reading! Check out the video below! If you make any of these DIYs, show us using the hashtag #SorryGirlsSquad!